For physicians who want to expand their horizons and deliver care in different areas of the country, the Interstate Medical Licensure Compact can streamline the licensing process and allow you to act on locum tenens opportunities more quickly. 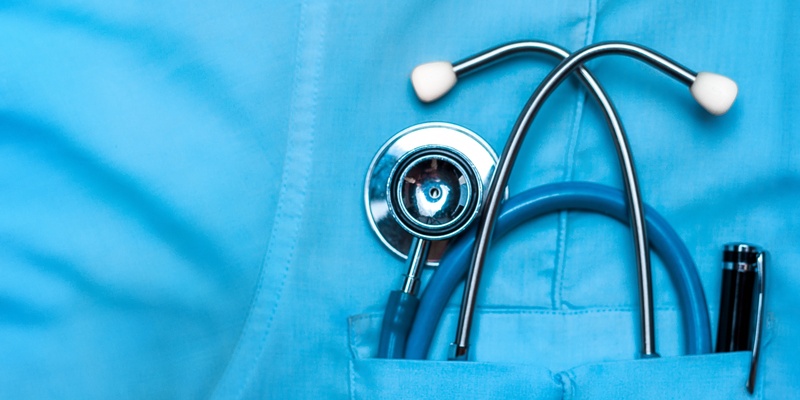 The launch of the Compact is great news—for doctors and underserved communities alike—but it’s still fairly recent, and physicians have questions. We covered what it takes to qualify for expedited licensure under the Compact in a previous post, as well as the basic steps a physician can expect when applying. Today, we’ll dive a little deeper and answer some common questions that come up for physicians, as answered by a Licensing Manager at VISTA. 1. How different is the process when applying for licensure through the Compact? If you are a physician and have been through standard licensure, you’re familiar with the mounds of paperwork involved, as well as the need to track down references, keep updated records, pay close attention to deadlines and make copies of everything you’ve ever done. It can add up to quite a lengthy process. The Compact was designed to make that process faster and easier. 2.How long does the process really take? A few weeks to multiple licenses may seem too good to be true. After all, in states like Arizona, the standard licensing process can be as long as eight to twelve weeks. Since the launch of the Compact, VISTA has been averaging about a month flat—just 31 days—from start to finish. Securing your Letter of Qualification (LOQ) takes the longest, but after that, a full license is typically in hand within 24 hours. Your LOQ is good for one calendar year, during which you can apply for any participating state licenses, pay the state licensure fee and get a full, unrestricted license for that state within a few days). 3. Where can a physician turn to get started? 1. Apply directly with the IMLC: You can apply directly on the Compact’s website. You’ll be directed to select your State of Principal Licensure (SPL), pay a non-refundable $700 application fee, and complete a short application and background check. Then, if qualified, you will be invited to select the IMLC Member States where you wish to be licensed and submit your license fees for those states. 2. Work with VISTA: When you work with VISTA, we can help you through every step of the way. Your individual state license fees are covered and, in many cases, so are your initial application costs. 4. How soon after getting their license can a physician start work? Immediately! Once you complete the necessary steps, the Compact will issue a full, unrestricted license as if you went through the traditional process. It’s good for the same amount of time and the renewal process is the same. 5. Can a provider get licensure through the IMLC without a target assignment in mind? At VISTA, we have had physicians license through the Compact without an assignment lined up. Most of the time, licensure through the Compact is designed to expedite a license in a target state for a specific job, and we highly recommend that physicians research their job options and approach the Compact in this way. 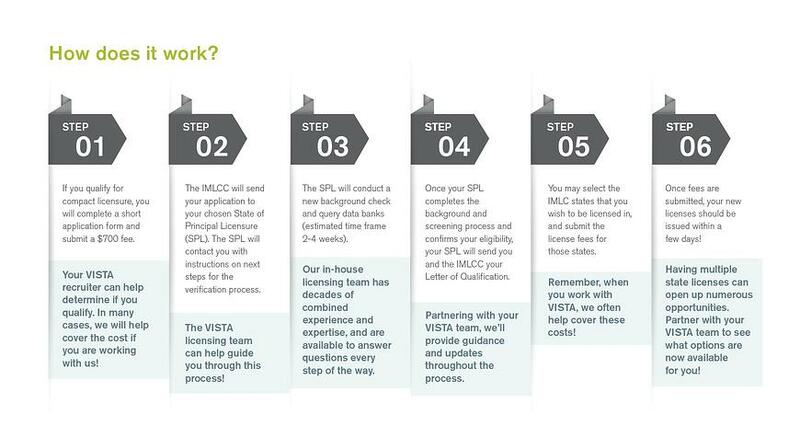 If you are interested in this new path to multi-state licensure but still have questions, contact VISTA. Ask to speak with a recruiter to put our experienced, in-house licensing team to work for you.